Our critically acclaimed documentary In the Game by Peabody-Award winning filmmaker Maria Finitzo’s is racking up screenings this spring, with upcoming appearances at New Zealand's Doc Edge, Chicago Latino Film Festival, Minneapolis-St.Paul Film Festival, Ashland Film Festival; at Governor's State and Stanford Universities; and at the prestigious Women Deliver and ASU GSV 2016 conferences. 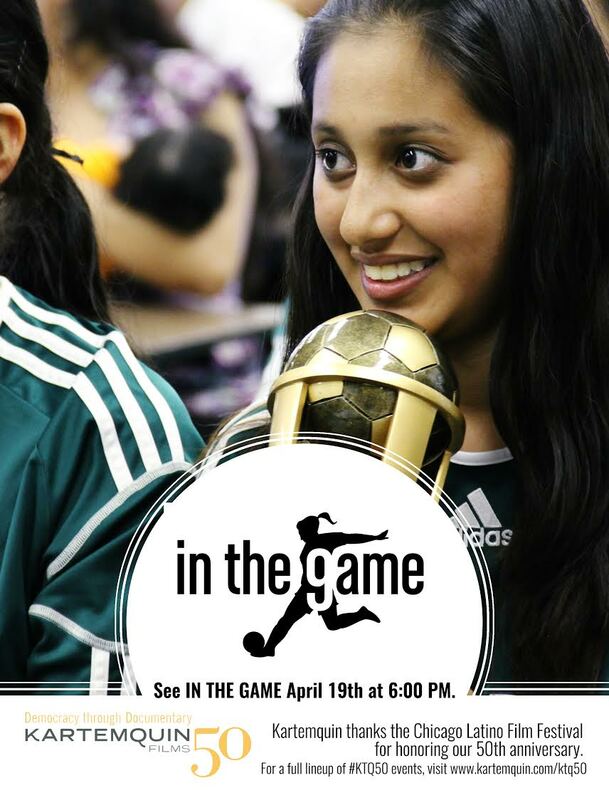 The 32nd Annual Chicago Latino Film Festival (CLFF) will celebrate Kartemquin’s 50th Anniversary with a special presentation of In the Game, April 19th at 6:00 pm at the AMC River East 21 Theatres. Considered the largest, most comprehensive and best Latino film festival in the United States, CLFF will screen over 100 feature and short films from all over Latin America, Spain, Portugal and the United States. Pepe Vargas, founder and executive director of the International Latino Cultural Center and the producer of the Chicago Latino Film Festival, Finitzo and Gordon Quinn, the Artistic Director of Kartemquin Films, will introduce the film. A question and answer session will follow the film’s screening. You can purchase tickets here and find the full schedule for CLFF here. “From Chicago’s muralist movement to an epic story about the hundreds of immigrants who have started new lives in this country, Kartemquin’s documentaries have played an indispensable role in chronicling this country’s neighborhoods and the people that live and work in them. In the Game introduces audiences to one of these communities, one that is rarely, if ever, covered by the mainstream media. It is a magnificent addition to one of the most powerful filmographies in the history of documentaries,” said Vargas in a statement. The Chicago Latino Film Festival will also hold student screenings on April 11 at 10:30 am and 11:15 am and April 12 at 10:30 am at the AMC River East 21 Theatres. These screenings are being held as part of the festival's Matinee Outreach Program. Before then, In the Game will screen at Ashland Independent Film Festival (AIFF) on April 8 at 9:40 pm, April 9 at 12:40 pm and April 10 at 3:40 pm. Director Finitzo will also be attending the screenings. The screenings are part of a retrospective honoring Kartemquin's 50th Anniversary, specifically focusing on films directed by and about women. You can purchase tickets here and find the festival's full schedule here. The 35th Minneapolis St. Paul International Film Festival will also be screening In the Game on April 17 at 5:00 pm at the St. Anthony Main Theatre 5 and on April 19 at 6:30 pm at Metropolitan State University. Purchase tickets here and find the festival's full schedule here. In the film's Southern Hemisphere premiere, New Zealand's premiere international documentary film festival, Documentary Edge, will be screening In the Game on May 7 at 7:15 pm and May 10 at 6:15 pm in Wellington at The Roxy Cinema and May 21 at 2:15 pm and May 29 at 12:00 pm in Auckland at Q Theatre. You can purchase tickets here and find the festival's full schedule here. We're also delighted to announce that the 2016 ASU GSV Summit will be screening In the Game April 19 at Manchester Grand Hyatt in San Diego, California. Put on by Arizona State University and the investment firm GSV Capital, the upcoming conference will be held from April 18-20 and will include keynote speakers like Bill Gates and Dr. Condoleezza Rice among many others. 270 companies will be presenting to business leaders, investors, policymakers, entrepreneurs, educators, and philanthropists at the 7th annual summit in education innovation. More than 2,000 attendees are expected for this year. You can view the full schedule here. The film's Danish premiere will be at the 2016 Women Deliver conference in Copenhagen, May 16-19. Women Deliver’s conferences are the world’s largest global convenings to focus on the health, rights and well-being of girls and women. #WD2016 will be the largest gathering on girls’ and women’s health, rights, and wellbeing for more than a decade, and one of the first major global conferences following the launch of the Sustainable Development Goals (SDGs). The focus of the conference will be on how to implement SDGs as they relate to girls and women, with a specific focus on health – in particular maternal, sexual, and reproductive health and rights – and the inter-connections with gender equality, education, environment, and economic empowerment. View all #WD2016 film selections. Closer to home, the Evanston YWCA will also be screening In the Game on April 14 at 6:30 pm at the Wilmette Theatre. The screening will be followed by a discussion featuring Finitzo and the producer Mary Morrissette along with the cast. The screening is part of the Women's Film Series that aims to raise awareness to crucial issues affecting women and girls. You can find more information here. As part of One Book, One Chicago's 2014-2016 season, the Chicago Public Library will screen In the Game on April 13 from 5:30 pm to 7:30 pm at the West Pullman Library. The screening will be followed by a discussion with guides available in English and Spanish. The season explores the topic of "Chicago: The City That Gives." You can find more information here. In the Game will also be screened in colleges at Governors State University on April 6 at 12:00 pm and at Stanford. More information to come. In the Game - Official Trailer (2015 Documentary) from Kartemquin Films on Vimeo. In the Game follows the ups and downs of a girls’ soccer team to reveal the very real obstacles that low-income students confront in their quest for higher education. The girls face an uneven playing field – or in the case of the girls at Kelly High School, no soccer field at all– comprising problems at home, discrimination, and poverty, but remain undaunted thanks to their teammates and the dedicated mentoring of their coach. Grasshopper Films recently acquired the video-on-demand and non-theatrical rights to the documentary. Book a screening. Find information on future In the Game screenings here.